note – i composed this post last week so these outfits may not be at the top of their blogs anymore! still, check them out because they’re all lovely! 1. scarberian fashion lover – i’ve mentioned emmy before on this blog, but i adore her subtle leopard jeans in this outfit / 2. walk in wonderland – sheryl’s blog is a new find for me but i love her red jeans / 3. who is hanna – love love love her jacket / 4. fashion steele nyc – after buying my chloe boots, i’m a huge lover of red boots and this outfit is great! 5. london’s closet – love the polka dots / 6. gemma satire – already told her how much i love this look, but here it is again. damn it’s a good dress! / 7. in my dreams – jenaly’s look is so soft and lovely, might have to copy it in autumn! / 8. done n done – amazing hair and legs that go on forever, jealous on so many levels. i think gucci was my favourite A/W show and it’s lovely to see their clothes actually online. pity they’re like £2k+ a piece, wahh. wish i could somehow justify the acne boots as they’re fantastic, same with the rose gold watch. everyone needs some glitter on the soles of their shoes and i’m absolutely determined to buy a burberry trench this winter. watch this space. everyone should use liquid gold, seriously. i thought i’d be allergic to it as i am to everything else and anything with ‘acid’ in it would literally destroy my face, but i’m so glad i tried it. i’ve only used it 4 times, but the scars left behind by blemishes have faded, my skin is smoother and my skintone is more even. amazing. as said in a previous post, i’m glad i welcomed moroccan oil (light version) back into my life, after one use i saw a difference. 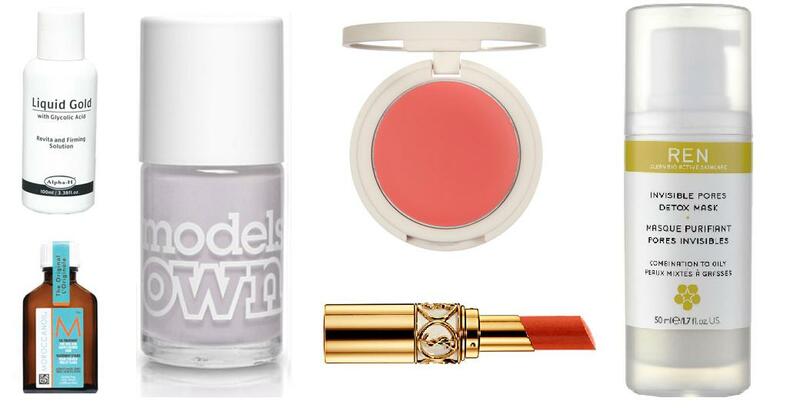 models own utopia and that blusher are pretty standard, but lovely none the less. i have about 8 more YSL lipsticks on my want list much to my bank account’s dismay and that REN mask is so, so good. buy it. buy it now. ps. don’t forget to enter into my giveaway here to win a MAC lipstick and the whole models own hed kandi collection! it’s worldwide, too! pps. would you like to advertise your blog or shop on here? check out my sponsors section for more information! Previous Post giveaway: mac lipstick and models own for my 500th post!